I did ponder whether to write this but as I love an opportunity to talk beauty I couldn’t really not share some of my favourites from Santa this year! Between these goodies below and what I spent my Christmas pennies on I’ve had a pretty beauty filled Christmas which is perfectly timed as I’ve run out of a lot of things lately! I got rather excited when I saw the Elemis gift bag as frankly I love everything they do and definitely neglect them way too much when I’m in the market for skincare. Anyway, in the bag I found a cute cotton bag featuring the amazing smelling Frangipani Monoi shower gel and body cream. 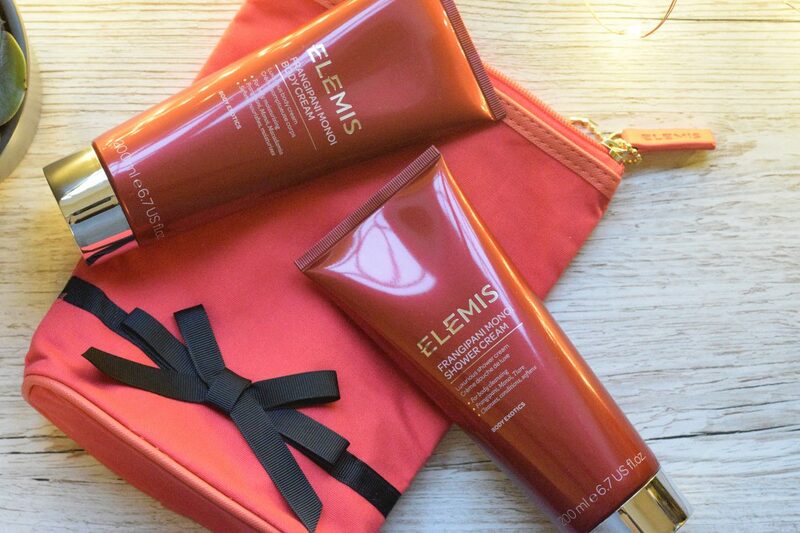 As usual with Elemis, the packaging is classic and will look lovely on my bathroom shelves! This isn’t my usual fruity kind of fragrance but I’m really loving it. It’s nice and strong and almost reminds me of the original Opium scent. It feels really luxurious and makes me skin feel pretty amazing after use. My next gift was from another great brand that I love. This combo of mascara, primer and eyeliner makes a very nice little gift. After the slightly disappointment of the YSL Eyeliner from last year, I’m hoping this Doublewear Eyeliner will live up to it’s name. As I’ve never actually used a lash primer before I’m really intrigued as to how this works and will be doing some tests on the mascara with and without it for sure. The strangest thing happened in December, I ran out of shower gel! I was down to my last travel sizes! I can’t remember the last time that actually happened. That meant that this gift was very well timed! Gingerlily is my favourite Molton Brown fragrance ever and I was so sad when they discontinued the perfume ages ago! Pink Pepperpod is a lovely sweet fragrance that I’ve had before and the Sensual Hanaleni is new for me. Sensual is definitely the right word for it and I can’t wait to get this in a bath. The scent is lovely and rich and reminds me a bit of burning incense. So this present I knew I was getting. After getting a sample in a beauty box (probably Look Fantastic) I knew this had to be my next perfume once my Black Opium ran out. This is my typical kind of scent – sweet (without being sickly) and strong. The cute mini mascara and clear lip gloss completed a very nice gift set. They almost look too pretty to use! If you haven’t tried this before, definitely give it a spritz the next time you’re in Boots. Here’s hoping Santa was as good to you this Christmas! If you got any great beauty gifts, be sure to let me know in the comments below! Also, if you’d like particular reviews of any of the above after some more use, also drop me a note below!